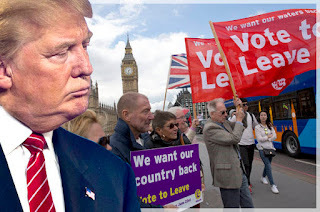 Are there similarities between the UK's Brexit and the mindset that gave the USA Trump? Of course there are. 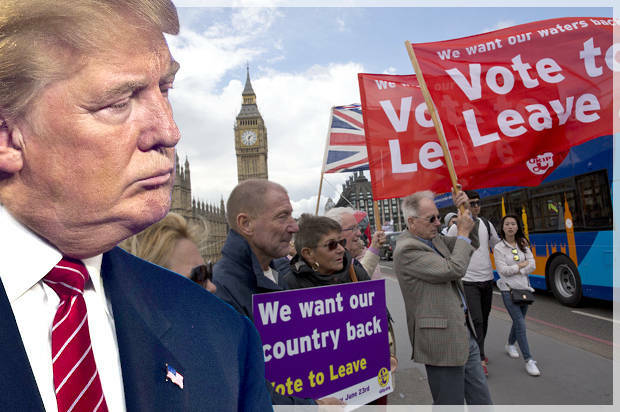 Both the Brexit campaign and theTrump campaign found new voters among those previously disenfranchised. Many of these people had not bothered to vote before because all the candidates seemed to amount to the same thing. These people discovered a new sort of politics they could understand, something they felt was worth going out and voting for. Both campaigns promoted the idea that the established political parties were in thrall of an elite - a combination of established media and authority who had conspired to leave ordinary people baffled, poor and helpless. But now there was a new, straightforward option available. The appeal of one button to fix all problems is huge and everyone wants to believe that there are answers to long standing problems. But in classic storytelling changes to the old order must produce losers as well as winners. For the new narratives of Trump and Brexit to appear plausible the campaigns had to explain who the new losers would be. And these losers would be outsiders. For Brexit the losers will be the EU. Those faceless bureaucrats who have, it is claimed, taken over so much control of life in Britain. Post Brexit Britain will withdraw its funding to the EU so the new losers will not be the native British. There will also be an end to all those migrants who come to Britain to steal jobs, live on benefits and bring in new, non British values and customs. There will be justice! And now someone else will suffer. The Trump campaign, with no EU to focus on, took a slightly different tack. In the USA there are also outsiders who will be punished, migrants and foreign countries who will have to pay. Those countries, such as Europe, are the ones, it was claimed, who have long had a free ride at the expense of the USA (NATO being largely funded by the USA). And the Trump campaign dug further into the various conspiracy theories that the conservative press have promoted. Climate change is, according to Trump, promoted by the Chinese in order to make American industry ineffective. Both campaigns, while claiming to reject a media that has long conspired with the mainstream political elite, actually depended on support from new media. Raheem Kassam, who is part of Nigel Farage's UKIP team is now head of Breitbart London. Stephen Bannon, who ran Trump's campaign was formerly the Executive Chairman of Breitbart News. Breitbart News (USA). Bannon is now being described as chief strategist for Trump's new presidential administration. Breitbart is also planning to expand into France and Germany to exploit the nationalist waves there. Monetizing Nationalism. In the UK large sections of the traditional print media, the Sun and the Daily Mail took up for Brexit. These outlets often used ideas and slogans drawn from the new media. And at the top of the food-chain the Daily Telegraph provided a less febrile rationalisation for Brexit. These new media reports are created by professionals. But a few minutes looking at internet forums, even Facebook posts, reveal that the kind of rhetoric that gets hashed up in the likes of Breitbart and the tabloids has entered common use. www.pprune.org is a mainly aviation website. It carries a section called Jet Blast which has become largely an echo chamber for the right wing media. Internet forums such as this constitute a kind of community, mainly populated by retired people, where like-minded souls congregate and rehearse their arguments and rationalisations. The new media has provided a rhetoric which serves in place of actual discussion. For example, 'Project Fear', is the label used, and still rolled out, whenever a potential downside to Brexit is described. Such labels are not arguments but conversation stoppers that prevent the need to actually consider the point being made. On forums like pprune anyone can participate in a form of debate which consists mainly of copy/pasting slogans and clips from online media. It's been said that prior to the new media explosion, which started in the 1980s with cable and satellite TV, the media had to be more balanced because its customer base was so broad that it could not afford extreme views. But now, as media options have broadened, space for more extreme views has been made. I'm not sure I totally agree. Even in the 1950s the British Daily Express was a platform for pretty right wing rhetoric and in the 1930s the Daily Mail famously ran editorials in support of Hitler. Perhaps the main difference now is that people can actively rebroadcast their support for extremism and find confirmation for it without even leaving the house. The internet, like the polling booth, provides an anonymous space where people can voice their most extreme prejudices. They'll find a space somewhere where no one will question the logic or the propriety of their choices. This provides a kind of confirmation. The expression that these new medias provide has brought marginal and improbable arguments into the mainstream. Responsible media must find time, in the interests of balance, to cover these views. Such coverage then gives a kind of authority to contrarian opinions on such solid, proven issues as climate change. Lay people can be left with the view that even hard science is worth no more than personal preference. This, somehow, has mobilised the disenfranchised who voted for Brexit and Trump. But after all the campaigning what happens next? What happens when their supporters discover that Trump and Brexit cannot deliver. Do they shrug and let the old order reestablish itself? Somehow I think not. There is a modern era precedent for the populism of Farage and Trump. This comes in the form of Silvio Berlusconi, another man who made grand promises and failed to deliver. He presented himself has a non-establishment figure who would challenge the political elites. Every time Berlusconi failed to deliver on his promises he made new ones and the public forgave him. The fact that he controls 90% of the Italian media doubtless helped. And so it will be with the promises of Brexit and Trump. When Brexit fails to improve the lot of those who came out to vote for it, it'll be the EU's fault or perhaps the government that lost its nerve. When Trump fails to build his wall or lock up Hilary Clinton there'll be new excuses and new promises to distract and enthuse his supporters. And why not? Berlusconi managed to keep it going for nine years. Will the British and the Americans be less gullible than the Italians? We shall see.